Last night's leaders debate certainly threw up some surprises with David Cameron and Ed Miliband being forced into the background while the outsiders grabbed their chance in the limelight. None took their opportunity so well as Nicola Sturgeon as the SNP leader took full advantage of the hectic nature of a seven way battle for the public's attention. Broadcast live to the nation, the Prime Minister, Miliband and Sturgeon were joined on stage by Liberal Democrat leader Nick Clegg, UKIP leader Nigel Farage, Green Party leader Natalie Bennett and Plaid Cymru leader Leanne Wood. Almost 8 million citizens tuned in to the debate which was broadcast simultaneously on ITV, Sky News and BBC News. Give the huge audience paying attention, all topics were up for discussion with the Prime Minister asking for a chance to continue with a plan that is working for Britain. Miliband focused on tuition fees and outlined his vision for education while Farage unsurprisingly reiterated UKIP's anti immigration stance. Nick Clegg focused most of his attention on promising to tax the wealthiest people in the country in order to ease the burden on the squeezed middle. However, it was Sturgeon that struck a chord with the public with her attack on austerity measures that both Bennett and Wood also criticised with all 3 female leaders outlining plans to improve things on that front. 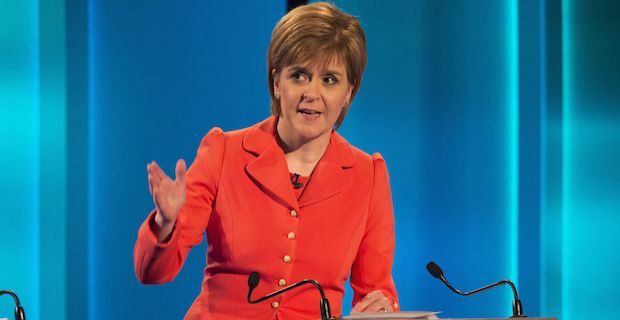 A YouGov poll which sampled 1,100 from the British public, 28% agreed that Sturgeon had won the debate ahead of Farage on 20% and the same poll had the Prime Minister ahead of rival Miliband. In terms of the two main candidates, there was not a whole lot between them as a Guardian snap poll indicated that Miliband edged it over Cameron by winning 25% and 24% respectively. A ComRes-ITV poll showed Cameron and Miliband in a tie with UKIP leader Nigel Farage on 21% each while Sturgeon managed to punch well above her weight to take 20% of the share.